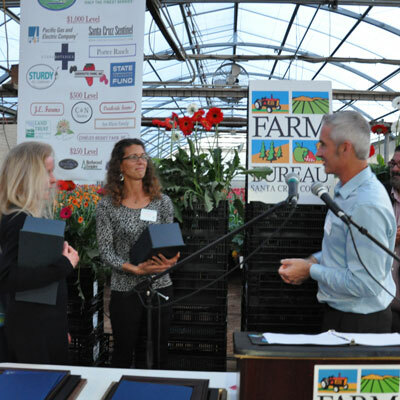 Marguerite Remde and Chris Banthien have been selected by the Santa Cruz County Farm Bureau as the 2015 “Farmers of the Year.” This is the first time the Farm Bureau has selected two recipients. This award is presented annually to the farmer(s) who have contributed beyond their normal farming duties to help the community. The presentation was made during its 98th Annual Meeting held Friday, June 19, 2015 at Kitayama Brothers in Watsonville. The board of directors felt it was appropriate to honor Marguerite and Chris because of their dedication to the community and their significant contributions within Santa Cruz County and the Pajaro Valley. It was noted during the presentation that these two farmers also grow commodities that use very little water. Featured speaker for the evening was John Laird, Secretary of the California Natural Resources Agency, who spoke on the topic “The Drought and California’s Water Future” Master and Mistress of Ceremonies was David Van Lennep, President, Santa Cruz County Farm Bureau and Past-President Cynthia Mathiesen.